Hemophilia may be congenital or acquired. Acquired hemophilia A  is rare and is caused by the development of autoantibodies to factor VIII of the coagulation cascade, occurring maximum among young women in the postpartum period and in the elderly patients. The management of dental trauma in hemophilic children needs a prompt attention to decrease the amount of blood loss and apprehension. Commonly available materials in the dental clinic to assist in stopping of bleeding episode include pressure pack, ice application, vasoconstrictors and suturing. Both the local and systemic management is essential in such patients till the complete healing occurs. 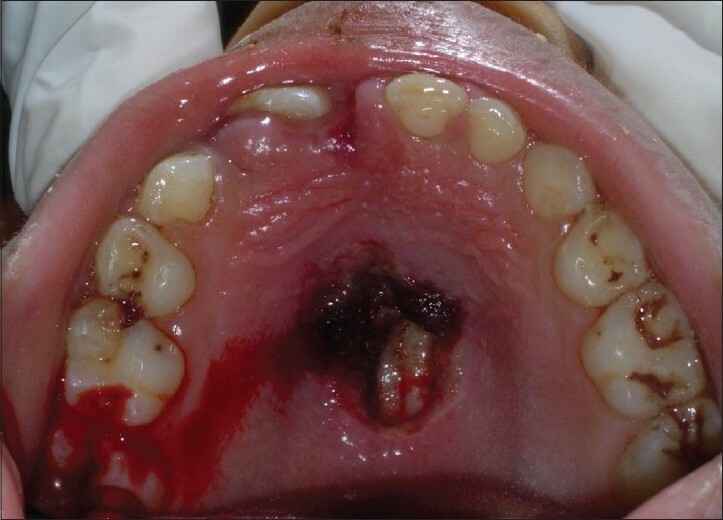 This case report presents the emergency and follow-up treatment that is required in managing the bleeding wound in the oral cavity of a hemophilic child. To explain the benefits of intraoral palatal stent in palate injury in hemophilics to provide continuous pressure, stabilize the clot and allow local delivery of hemostatic agent. A 13-year-old male patient [Figure 1] was referred to the Department of Pedodontics and Preventive Dentistry, K.L.E.S's Institute of Dental Sciences, Belgaum, Karnataka, India with the complaint of bleeding in the center of the hard palate region since 4 days. The causative factor was self inflicted trauma with a lead pencil ("Pencil injury") which accidently pierced the middle part of his hard palate. The patient had reported to a general practitioner where an attempt had been made to stop bleeding with a gauze pack. Since hemostasis could not be achieved the patient was referred to the specialty center for further follow-up. There was no relevant past dental history. Past medical history of the child revealed that he was a diagnosed case of hemophilia A and he was taking regular replacement therapies in the hospital since 7-8 years. His blood investigation reports and factor assay confirmed him a case of hemophilia A. Recent blood reports showed low level of hemoglobin percentage; activated partial thromboplastin time was elevated to 117 (normal < 35) seconds, prolonged clotting time and normal bleeding time. Blood plasma level of Factor VIII was around 3.25 %. The family history revealed that the disease was inherited from the child's maternal side, but his younger sibling was a normal non-hemophilic male. The child's mother was asymptomatic. On general examination, the child had a slim built and he appeared slightly underweight. The child was afebrile and his vital signs were stable. Extraoral examination revealed presence of a subcutaneous bruise on the dorsal part of right hand of the patient, without any known history of trauma [Figure 1]. The patient had no other bruising, nosebleeds, hematuria, bloody stools or hemoptysis. Intraoral examination revealed a frank bleeding area in the deepest part of the hard palate [Figure 2]. Profuse, spontaneous bleeding was noted on removal of the gauze pack. On palpation, it was noticed that the injury was limited to the mucosal surface of the hard palate and did not reveal any bony involvement. So no intraoral radiograph was advised. As soon as the child was referred to the department, adrenaline-soaked pressure pack was applied to control bleeding. An intraoral palatal stent was planned to provide continuous pressure, stabilize the clot and allow local delivery of hemostatic agent. The central part of the stent was planned with a small cavity. Gauze packs and ice were used alternatively for temporary reduction of bleeding until the fabrication of stent. The specialty medical hospital was informed for the admission of the patient and the provision of intravenous infusion of factor VIII concentrate. For the fabrication of stent, maxillary impression was taken with alginate impression material. Taking impression was a slightly tricky issue as bleeding reduced the accessibility and visibility of the area. Constant high volume evacuation was done to prevent any respiratory obstruction. Emergency resuscitation equipment was kept ready, but was not needed. On the impression a 2-mm wax spacer was placed and the cast was poured [Figure 3]. Close adapting stent was fabricated with a thermoplastic silicone rubber (biostar) under vacuum [Figure 4]. The stent was trimmed and finished, so as not to have any sharp margins that can cause injury to the surrounding gingivae. In the central part of the stent, one 500 mg capsule of tranxemic acid was crushed and applied as a paste. The stent was placed intraorally and light, steady pressure was applied in the mid-palatal region [Figure 4]. The patient was instructed to use Chlorhexidine mouthwash and tranxemic acid solution rinses (4.8%) to be swished and swallowed. Patient was advised not to brush or floss for 2-3 days and to have liquids for initial 24 - 48 hrs and soft diet for 1-2 weeks. The patient was admitted under supervision for 3 days, where Recombinant factor VIII (rFVIII) intravenous infusion of 15-25 U/kg twice a day was given. In the stent, 500 mg capsule of tranxemic acid was crushed and a paste was made using distilled water, which was replaced every 6 hourly. After 7 days, the stent was removed and the traumatized area showed signs of healing. The patient was recalled after 10 days. There was complete healing in the palatal area with ecchymosis [Figure 5]. The patient was kept under regular observation. In hemophilics it would be beneficial for high risk families to take prenatal gene detection and carrier screening can be done most effectively (87.8%) by five polymerase chain reaction (PCR) based polymorphic markers and restriction fragment length polymorphisms (RFLP) in Indian population. Saha A  et al established the utility of a combination of SNP and microsatellite markers for successful identification of carriers in the affected families. In the dental management of hemophilic patients, it is important to manage the bleeding areas and also prevent any trauma during dental procedure. Impressions were taken with plastic trays to minimize injury of oral tissues. In the impression, a 2-mm wax spacer was placed before pouring the cast. An alternative technique would be to take the impression with the gauze pressure pack placed over the wound. Since thermoplastic silicone rubber (biostar) stent is made under vacuum, it closely adapts to the oral tissues and is more retentive in nature. It delivers continuous pressure on the bleeding site and provides better stability to the forming clot. Acrylic stent can also be prepared, but it has certain disadvantages, like, its sharp margins may injure the surrounding tissues, questionable retention, and/ or speech problems for the child. The stent supports the forming clot and prevents overgrowth of the healing tissue. Local hemostatic agents include pressure surgical packs, vasoconstrictors, sutures, topical thrombin, fibrin sealant (glue), collagen gel, oxidized cellulose (Surgicel), calcium alginate and ice therapy. Ice application helps to decrease inflammation and swelling by decreasing leukocyte-endothelial interactions. Ice must be applied over a wet towel intermittently for periods of 5 minutes to achieve a 10-15΀C lowering of temperature in the deeper tissues. Suturing of the wound could have been tried, but due to thick firmly adherent palatal mucosa, local styptics were opted. Hemophilic patients should avoid drugs that affect platelet function, particularly acetylsalicylic acid (ASA) and non-steroidal anti-inflammatory drugs (NSAIDs) except certain COX-2 inhibitors. Quite often, regular oral hygiene procedures like brushing and flossing are avoided by such patients due to bleeding during these activities. Even dental specialists avoid these candidates for fear of untoward incidents in the dental office. It should be the prerogative of the National Hemophilia Organization in each country to identify all persons with hemophilia and target them with a dental preventive program to reduce the incidence of dental diseases. Management of bleeding in hemophilic children needs a prompt and minimally invasive treatment approach. For rendering immediate treatment a team work is needed with availability of proper materials. Such cases of emergency must be given special attention, even if it may need to postpone the other scheduled appointments. We would like to thank Dr. Indushekar KR, Professor and Head, K.L.E.S's Institute of Dental Sciences, Belgaum, Karnataka for his guidance and support. 1. Casper, Braunwalt, Fauci. Harrison′s Book of Internal Medicine. Alterations in Circulatory and respiratory functions. 16 th ed. Section 5. New Delhi Mc Graw Hill;p. 199. 2. Chandy M, Khanduri U, Dennison D. Developing hemophilia services in India. Southeast Asian J Trop Med Public Health 1993;24:66-8. 3. Greenberg MS, Glick M, Ship JA. Burket′s Oral Medicine. Bleeding and Clotting disorders. 11 th ed. Chap. 17. Ontario: BC Decker Inc.;  p. 419. 4. Kumar B. Acquired hemophilia as a paraneoplastic manifestation of gastrointestinal stromal tumor. South Med J. 2010;103:704-5. 5. Chowdhury MR, Tiwari M, Kabra M, Menon PS. Prenatal diagnosis in hemophilia A using factor VIII gene polymorphism- Indian experience. Ann Hematol 2003;82:427-30. 6. Saha A, Mukherjee S, Maulik M, Chandak GR. Evaluation of genetic markers linked to hemophilia A locus: An Indian experience. Haematologica 2007;92:1725-6. 7. Laguna P, Klukowska A. Management of oral bleedings with recombinant factor VIIa in children with haemophilia A and inhibitor. Haemophilia 2005;11:2-4. 8. Mac Auley DC. Ice therapy: How good is the evidence? Int J Sports Med 2001;2:379-84. 9. Verstraete M. Clinical application of inhibitors of fibrinolysis. Drugs1985;29:236-61. 10. Coetzee MJ. The use of topical crushed tranexamic acid tablets to control bleeding after dental surgery and from skin ulcers in haemophilia. Haemophilia 2007;13:443-4. 11. Sindet-Pedersen S, Ramström G, Bernvil S, Blombäck M. Hemostatic effect of tranexamic acid mouthwash in anticoagulant treated patients undergoing oral surgery. N Engl J Med 1989;20:840-3. 12. Factor VIII Chromogenix Monograph Series Page no.10. Available from: http://www.chromogenix.com/monographs/005%20-%20Factor%20VIII.pdf [Last accessed on 2010 Oct 5]. 13. Drug delivery and development Pfizer Granted Approval for New XYNTHA Delivery Method Drug Discovery and Development. Available from: http://www.dddmag.com/news-Pfizer-Granted-Approval-For-New-XYNTHA-Delivery-Method-81710.aspx . Submitted on 2010 August 17 [Last accessed on 2010 Oct 8]. 14. Martinowitz U, Luboshitz J, Bashari D, Ravid B, Gorina E, Regan L, et al. Stability, efficacy, and safety of continuously infused sucrose-formulated recombinant factor VIII (rFVIII-FS) during surgery in patients with severe hemophilia. Hemophilia 2009;15:676-85. 15. Frederica Cassis. The World Federation of Hemophilia, 2009. Available from: http://www.wfh.org/index.asp?lang=EN [Last accessed on 2010 Oct 8]. 16. Kumar JN, Kumar RA, Varadarajan R, Sharma N. Specialty dentistry for the hemophiliac: Is there a protocol in place? Indian J Dent Res 2007;18:48-54.